I would call this past November and much of December normal CT winter conditions. Temperatures were cold, but not frigid, and snowfall was manageable. By late December that had changed with an uncomfortable combination of frigid temperatures, strong wind and sporadic snow. Windchill values of -20 degrees F have been common. Weather professionals are using the term “Bomb Cyclone” to describe it. I’ve never heard that term before. I hope all of you have stayed warm and safe during this winter freeze. The photo displayed is Sandra and I with a portion of my family for Christmas in Florida. 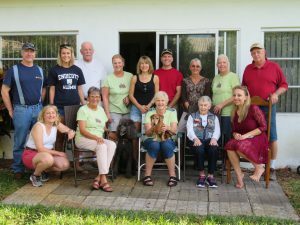 In the photo is my aunt (sitting with the dog), cousins and friends who invited us to join in their family Christmas gathering. They are a great group of people who know how to have fun. Admittedly, it is a bit unusual for us to celebrate Christmas with palm trees and temperatures in the mid-seventies. But, unusual or not, we had a great time during our short visit. We hope they feel the same. The markets finished 2017 on a strong note. U.S. stocks as represented by the S&P 500 index were up +6.64% for the quarter and +21.83% for the year. Global stocks ex-US were up +5.00% for the quarter and +27.19% for the year. Emerging market stocks outperformed developed international stocks for the year at +37.28% and +25.03%, respectively. Bonds were also up for the quarter with the Barclays aggregate index at +0.39% for the quarter and +3.54% for the year. Short-term US treasuries were up +0.23% for the quarter and +0.82% for the year. It would be impossible to look back at Q4-2017 and not talk about the tax reform I’ve mentioned in the past. On December 22, 2017 President Trump signed the Tax Cuts and Jobs Act into law. It was a substantial victory for Trump and the GOP. In my view however, it is a mistake to call this new law, “tax reform.” For me, reform means simplifying or streamlining, which this law does not do. For most, it does represent a “tax cut”, which many will find appealing. The expectation of this tax law going into effect may have been part of the reason the U.S. stock market was so strong in the fourth quarter. By lowering the corporate tax rate from 35% to 21%, it is reasonable to assume corporate profits will increase, leading to some combination of business investment, dividend payments and/or wage growth. The first two of which would increase corporate values and thereby, stock prices. Investors seem happy. Politically, I don’t see 2018 being all that productive. First, it’s an election year and attention will shift with each passing month. Second, now that the GOP has used the reconciliation process to get its tax law in place, other legislative endeavors will likely not follow reconciliation. And that means 60 votes are needed in the Senate, and the GOP only holds 51 seats. I don’t envision a bi-partisan sentiment developing around the Trump administration. Looking at monetary policy, the Federal Reserve (Fed) raised rates three times in 2017 and is predicting the same for 2018. This could happen given the current strength in Gross Domestic Product (GDP) and employment. But, it’s important to remember that there is no guarantee these conditions will continue. As the Fed shrinks its balance sheet, which began in October, we can only guess how the markets and economy will respond. Any economic, or geopolitical blip along the way can restrain Fed rate increases. It is important to recognize that we are in uncharted territory with unconventional monetary policies of extended low-interest rates and substantial balance sheet growth. We can’t know how it will all play out as those policies unwind. For now, it is working. But the skeptic in me is paying close attention. My momentum indicators continue to suggest global stocks are in control, so I will hold those positions in appropriate portfolios. My biggest portfolio concern is with bonds. With interest rates rising, albeit slowly, the bond markets are starting to react. I’m adding emerging bonds and multi-sector bonds, and reducing exposure to aggregate index bonds in appropriate portfolios. I remain neutral on alternative investments.